We had a first snowfall today so as soon as I got home I went out with my camera. I posted a picture of the persimmon tree to my facebook page, saying that this tree and I aren’t quite ready for deep winter. One of my friends commented that she’d initially misread my comment as a “permission tree.” Linda’s misreading could actually be a fantastic idea. You may have heard of a Wishing Tree. Last June I took photos of the Wishing Tree at the Berkshire Botanical Garden. Many gardens include this tradition and there are many artists who have used this theme in indoor and outdoor installations. A Wishing Tree is similar to a prayer basket, only the keeper of the prayers is alive, growing, and reaching toward the sky. I need this tree. You? 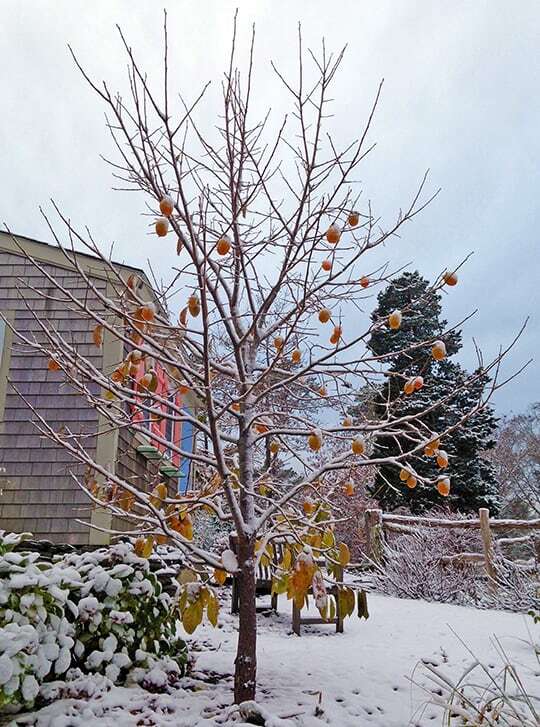 Here is my persimmon tree, ornamented with her fruit and a new snowfall. She is a bit young to be a Permission Tree, but after today I will think of her as that. Hopefully she's smarter than I am.